At Bike.com, found online also as Bike.com, you will find everything you could possibly need to, as their slogan says, "Go ride a bike!" With products such as clothing, bike parts, helmets and protective gear, tires and tubes, shoes, accessories, lights and electronics, repair and maintenance, bikes and frames, and bike safety and security, you will need to shop nowhere else before you set off on a biking excursion. For the best Bike.com discounts, Bike.com promotions, and Bike.com codes, check out none other than RetailSteal.com. Bike.com offers free shipping on orders over $69. If not completely satisfied, you may return your order and be refunded. Exclusions may apply. See Bike.com for details. Check out Bike.com and you can save up to 60% off biking apparel and accessories. Click link to shop. Visit Bike.com and enjoy 5% off your purchase of cycling apparel, parts, and gear. 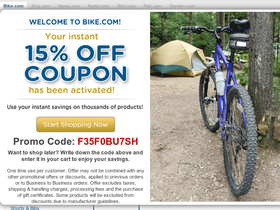 Use this coupon code at Bike.com today and save a full 10% on your purchase of $100 or more. Save up to 80% in the clearance section, only when you shop at Bike.com today. Shop online at Bike.com and you'll find a great selection of frames from only $249.95. Enjoy up to 40% off bike tires from Bike.com. Click link to shop. Get 50% off select street tires online at Cycle Gear Direct. Click link to buy. Use the coupon code to save $25 on any $125 online order at Cycle Gear Direct. Click link to shop. At Cycle Gear Direct, save 15% on any single item ordered using the coupon code. Click link for savings. Spend $25 or more on Cycle Gear Direct and use this code to get $10 savings. Enjoy free shipping from Cycle Gear Direct when you spend at least $79. Click link to shop.